ResilientAfrica Network » Thank you Prof. William Bazeyo for Diligently serving MakSPH! Home / Thank you Prof. William Bazeyo for Diligently serving MakSPH! Like Prof. William Bazeyo, Dean MakSPH and RAN Chief of Party has always put it both in writing and speech, ‘Be a Contribution’, the afternoon of Wednesday August 30, 2017 saw him, share the State of Makerere University School of Public Health (MakSPH) presentation with students, faculty, non-teaching staff and the general public. 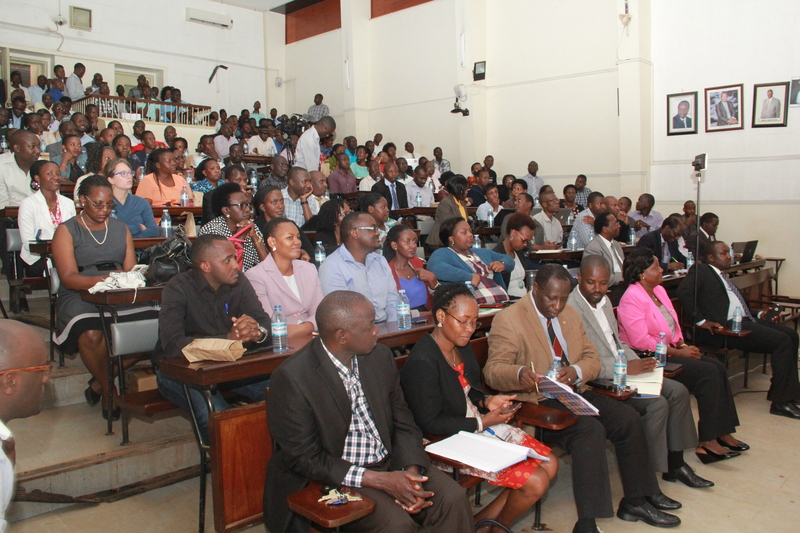 Prof. Bazeyo’s diligent service during his term as the Dean was witnessed in the big number of people who filled the Davies Lecture Theatre in Makerere University College of Health Sciences and patiently listened to and engaged with Prof. Bazeyo for over 3 hours! ‘Look at how my people are standing at the back of this lecture Theatre, they do not have where to sit but also, we all can not fit in this theatre and thus the need for all of us to support the project-constructing a bigger home for MakSPH. Mobilization work is progressing on well and we thank all of you for the support thus far. Please continue supporting us and also share the message widely so that we solicit as much support as possible to put up a befitting home for MakSPH’ noted Prof. Bazeyo. This was an opportunity for Prof. Bazeyo to share an account of his 8 years in service highlighting achievements, lessons learned and challenges. Prof. Bazeyo’s term as the MakSPH Dean ends on September 30, 2017, what a legacy he is leaving at MakSPH, all of us would take pride in identifying with all the achievements and excellent work. It was exciting to once again follow through MakSPH’s development from a Department, to an Institute, later into a School and now, leadership and staff are working hard to register the School as a College of Public Health. ‘Let us continue working together to coin the School of Public Health as the College of Public Health, together we can achieve this milestone too’ Prof. Bazeyo therefore referred to the school as ‘a rolling School of Public Health’. More so, the School of Public Health under Prof. Bazeyo’s leadership is currently running 114 Projects which in addition to the work already being done by the students and faculty are richly contributing to further research in and development of the communities in Uganda and beyond. These projects provide employment of a human resource of 231 individuals. The management and staff of the School of Public Health have also registered further development of the infrastructural systems at MakSPH sharing the developments in some of the Kampala suburbs including Kasangati, Rakai and Kololo School of Public Health Annexes. Some of the projects housed in these annexes include; ResilientAfrica Network (RAN) www.ranlab.org, Center for Tobacco Control in Africa http://ctc-africa.org/, Monitoring Evaluation and Technical Support (METS) which Prof. Bazeyo clearly highlighted and thanked for all the efforts towards further supporting MakSPH. ‘All these projects have continued to richly contribute to supporting the operations of the School of Public Health as a service institution’ he added. Prof. Bazeyo also noted that although some of the buildings in these annexes have not yet been fully renovated, the roofs are made of asbestos thus strong and long lasting. 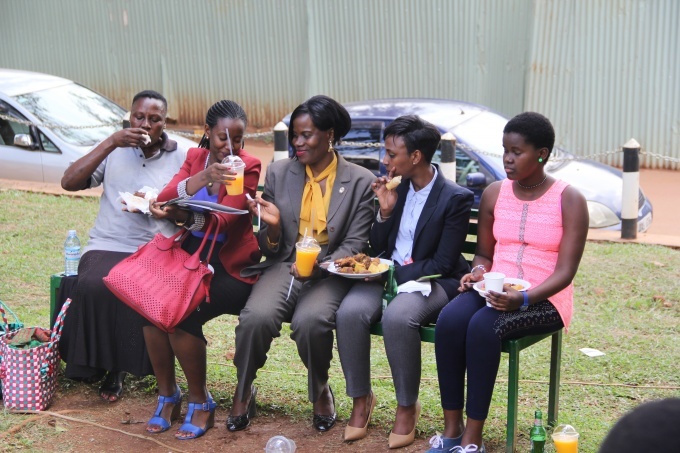 He noted that this should be some of the projects the MakSPH Dean Elect, Associate Prof. Rhoda Wanyenze can start with or even plan to include in her to-do-list so that adequate and ambient working space is fully secured for all the MakSPH staff. Prof. Bazeyo thanked everyone who has worked with him as part of the ‘Winning Team’ to register all the good work done by MakSPH. 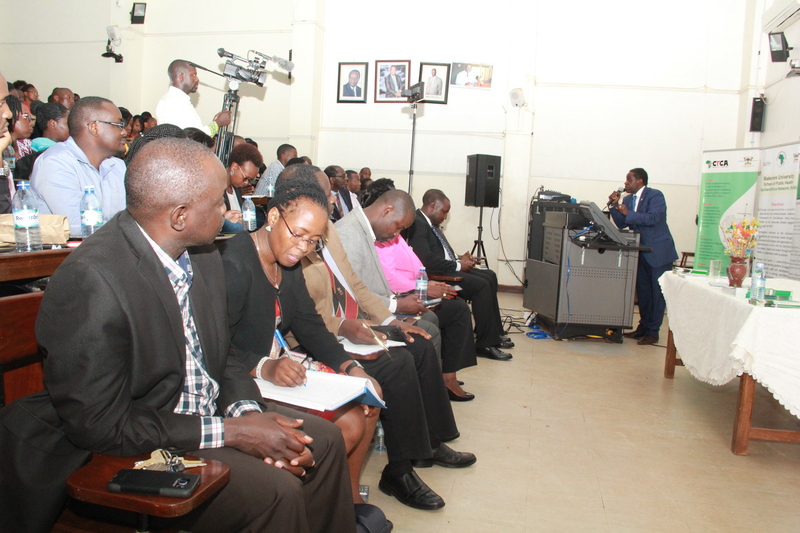 Among the people he openly and proudly talked about were; the Past Dean MakSPH and RAN Technical Advisor, Prof. David Serwadda who also chaired this session, Deputy Dean, Associate Prof. Christopher Garimoi Orach, the Registrar’s Office, Finance Management Unit, Grants writing team and the support staff who selflessly serve MakSPH. Prof. Bazeyo had a personalized plaque for all the staff who have since been working with him, majority of who are support staff. This gesture to publicly recognize majority of the support staff he has worked with, left all participants additionally applauding the simplicity and heart of appreciation in Prof. Bazeyo. 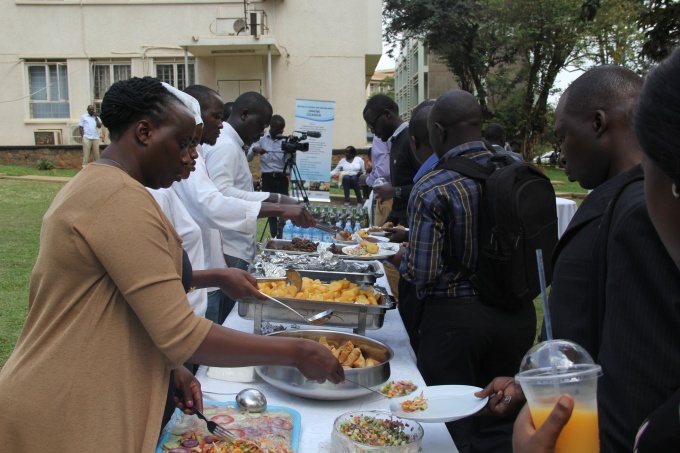 ‘It is not common that we serve with a team and as we are leaving the leadership role, we passionately thank them and recognize them in a public gathering, thank you William for being too open and generous too’ Prof. Serwadda shared. The fact that MakSPH has thus far nurtured and supported 24 staff members to attain the qualification of a PHD. The infrastructure including furnished office space, two high power/voltage generators, educated and experienced human resource, strong systems among others put in place at MakSPH to further support learning, research and development. That given the growing community need and thus number of those in service, there is need to construct for MakSPH a bigger home and Makerere University Main Administration has offered the School of Public Health space within the Main Campus to construct this home. ‘I am more than happy that as I hand over the leadership of this institution, I have left in cash more than 75% of the needed funds to build up to completion a six-storey building to house the School of Public Health. It is now up to the new administration to keep the ball rolling’ noted a smiling Prof. Bazeyo. ‘Having worked with Prof. Bazeyo for years now, I have personally started emulating his resource mobilization skills for community service’ the writer. That the key success factors which have enabled Prof. Bazeyo to excel in serving MakSPH include; remaining resilient in all situations, creating a team and knowing that team which you work with but above all trusting them and their capabilities in effectively performing, working on personality related issues- ‘what do you want people to see you as? A leader, a manager, a boss?’. It is important that you as a leader have an answer to this question above so that you work towards achieving your set goals and ambitions too. The fact that MakSPH has managed to train and sustain several non-Makerere University officially employed staff members through encouraging and supporting resource mobilization. 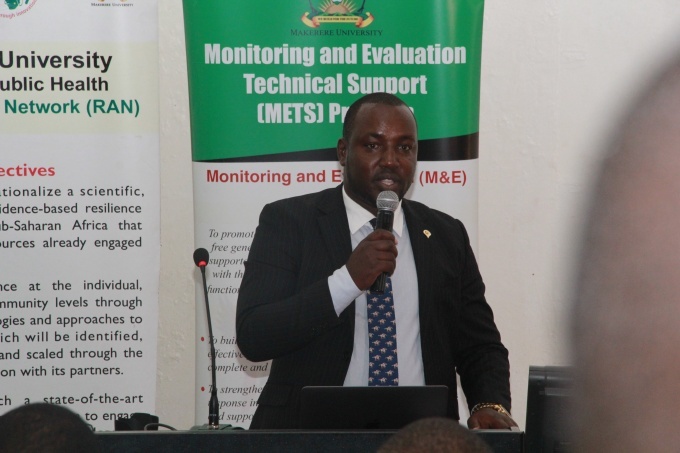 That MakSPH under the Geo Health Hub in Eastern Africa had recently installed equipment at the roof top of the current building to monitor air pollution in Kampala and the nearby suburbs. This is the second of its kind in Uganda, the first being used and operated at/by the US Embassy in Uganda. The data collected from this study will inform not only policy but also the further management of the city and later, the country at large. If you keep yesterday’s anger, you will most definitely loose tomorrow’s benefits. ‘Let go and move on working to achieve’, added a smiling Prof. Bazeyo. It is good to have friends, but make and have friends who make a difference in or add value to your life. Human beings are not easy to lead and work with and this can be a challenge to operations but never give up on anyone. Remain consistent and follow-up on every team member because Together Each Achieves More (TEAM) but also each individual has the potential to meaningfully contribute to the team. It is important that we explore that potential to the fullest. He emphasized the importance of not holding people to your first impression of them because ‘you will not reap the benefits of what they have to offer tomorrow’. Always endeavor to dig deeper to understand human beings as you deal with them and this will inform your ability to leverage from then, Prof. Bazeyo cautioned presentation attendees. Prof. Bazeyo also shared about the challenges in managing donor money, which comes with ‘high expectations’ and need to ‘maintain the credibility of the institution’. This he said calls for a lot of integrity and professionalism. 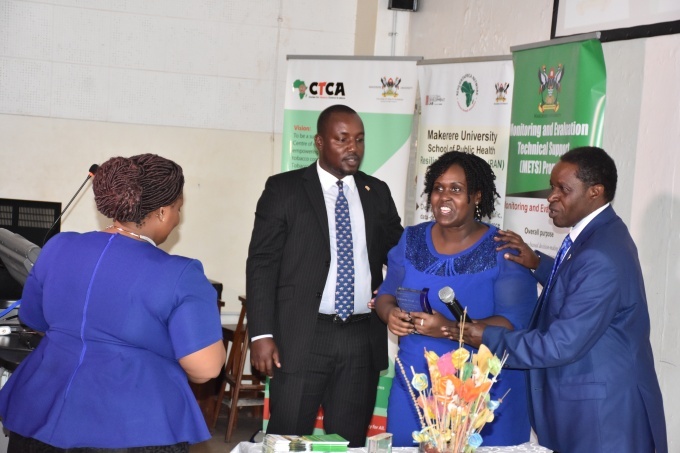 Associate Prof. Rhoda Wanyenze thanked Prof. Bazeyo for the hard and committed work noting that she was definitely not going to fit in Prof. Bazeyo’s shoes as the next MakSPH Dean. She said, ‘I will not attempt to fit in Prof. Bazeyo’s shoes, I will come in with my own pair of shoes, slightly smaller in size, a little bit brief/shorter, high off the floor and have the notorious habit of letting people know I am coming before I actually arrive to serve MakSPH’. 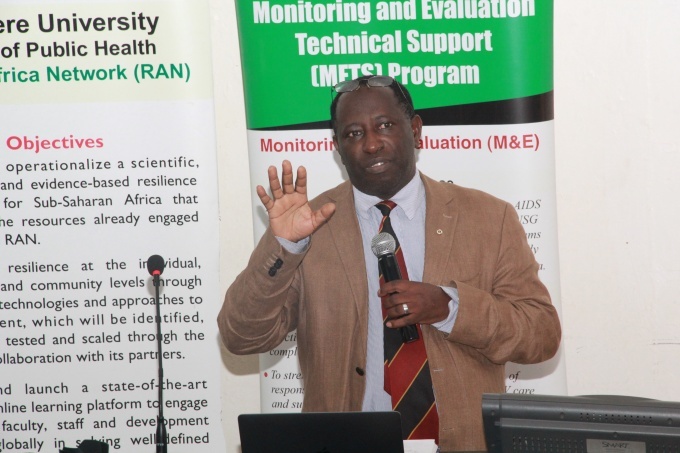 Prof. Bazeyo has left behind a rich legacy which we will all work towards further learning from and uplifting for the benefit of all of us at MakSPH and outside. As she concluded her remarks, she added that the success of all the past leaders will also be seen in their ability to support the Dean Elect to succeed. 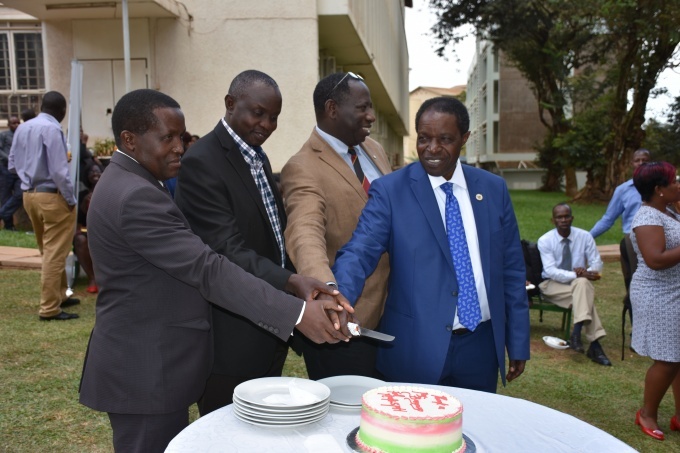 Prof. Charles Ibingira, the Principal Makerere University College of Health Sciences also hailed Prof. Bazeyo for his hard work noting that what could have led to all the achievements at MakSPH was the great and intact team Prof. Bazeyo put together, nurtured and closely worked with. ‘This MakSPH team is a strong one, let us all emulate them so that we develop and grow together as the College of Health Sciences spreading out to the Main Campus and other units too within this our Mother institution’ Prof. Ibingira shared. The Makerere University Council representative at this engagement, Mr. Bruce Kabaasa,Chairperson of the Appointments Board also joined all speakers to sincerely thank Prof. Bazeyo for the work well done noting that he was also happy with the growth and development of the School under Dean Bazeyo’s selfless, open and committed leadership. ‘I pray that the new leadership takes advantage of the already developed firm foundation left behind not only by Dean Bazeyo but also by the past leaders of the School. As the University Administration, we will continue to support the School to further grow as a service provision institution in Uganda and the globe at large’ added Mr. Kabaasa. He also congratulated the School for leading by example, achieving despite all odds and encouraged staff to keep up the team work he has found and experienced among them. Mr. Kabaasa challenged the School to come out to help and support other units of the University to grow at the same pace, leaving behind no one in Makerere. Additionally, he applauded the College of Health Sciences as a whole for the good work well done. 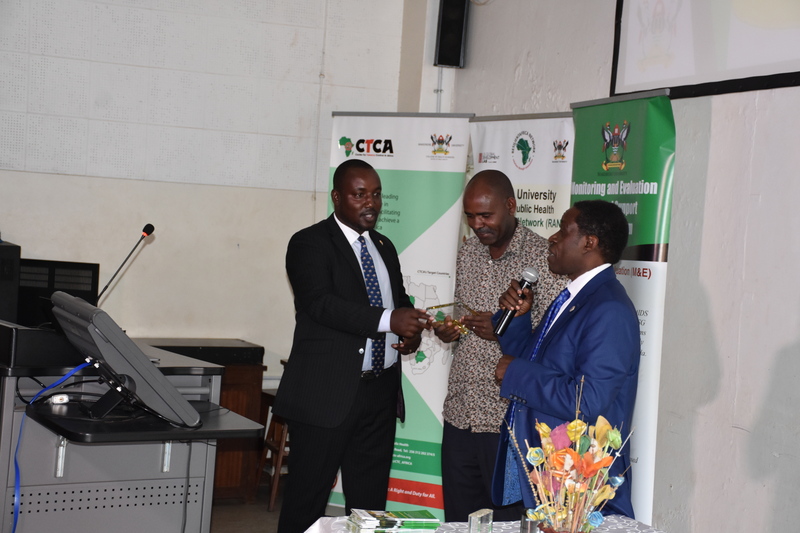 As he came to the close of his remarks, he introduced his colleagues Honorable Member of Parliament Thomas Tayebwa, Ruhinda North County, Mitooma District in Uganda and Associate Professor Sarah Ssali, School of Gender Studies, College of Humanities and Social Sciences. He thanked all participants for turning up in big numbers to listen to and engage with Prof. Bazeyo, specially thanking his colleagues for joining in the same engagement. This engagement was also attended by the University Director of Quality Assurance Prof. Vincent A Ssembatya. 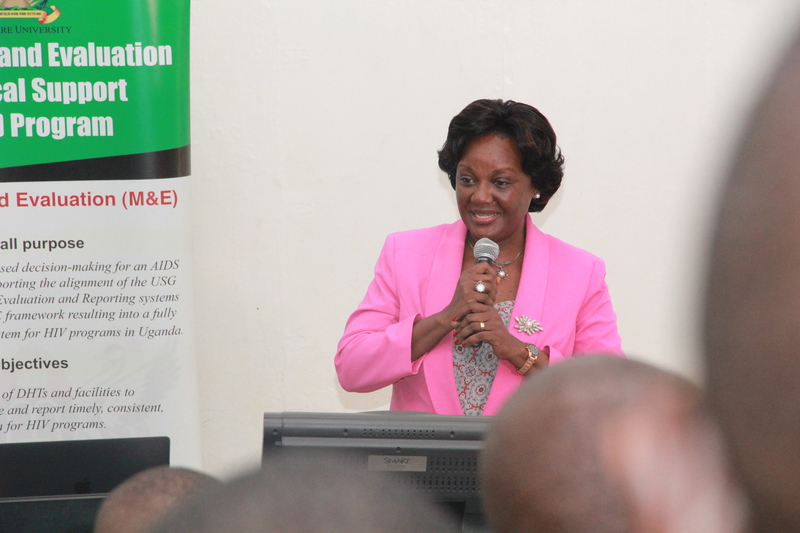 Thank you all for continuously supporting Makerere University College of Health Sciences School of Public Health http://musph.mak.ac.ug/. 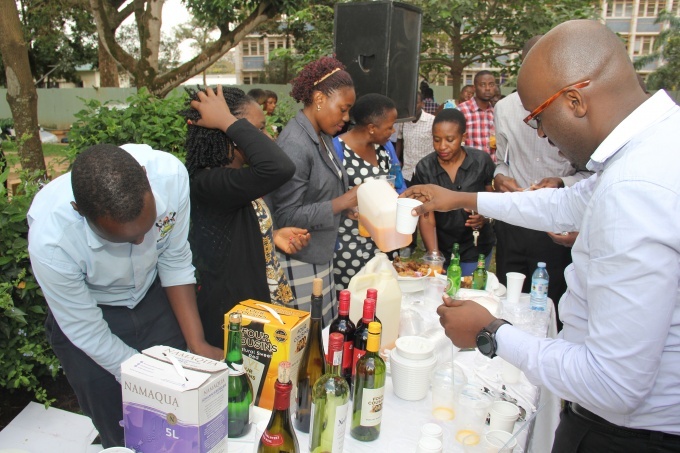 After all this sharing, participants were officially invited to a mouthwatering cocktail, sharing bites, drinks and cake in honor of and thanking Dean Bazeyo for ably leading the MakSPH team for the last 8 years. Dean Bazeyo a.k.a WBaz is also on Twitter @williambaz, please connect with him. 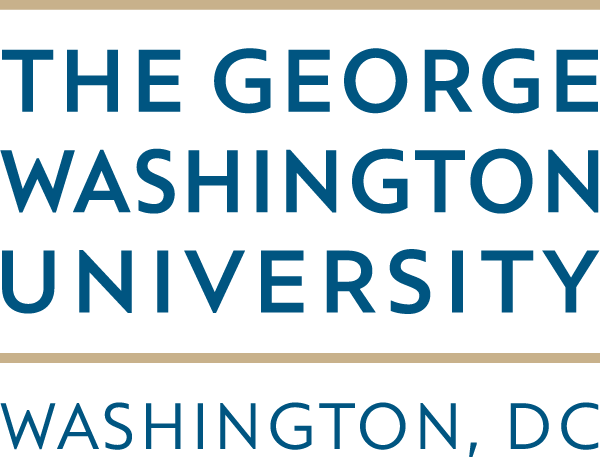 Long Live the School of Public Health and all its employees, alumni and well-wishers as ‘We Build for the Future’.